Everybody knows its coming and everyone is vying for a space on the MIA wall. From outsider artists, Foot in the Door gives Minnesota artists a chance to hang their work on the wall of a museum without a harrowing curatorial process. The curator in this case is 12"x12"x12" box. Chris Atkins, MAEP curator talks about the enormous undertaking that is Foot in the Door. Minneapolis Institute of Arts Foot in the Door exhibition: Be it quirky, classical or contemporary, the MIA hangs art of all varieties on its hallowed walls during the Foot in the Door exhibition. The only criteria is that the work measure up to the curator's standards - in this case that means fitting in a 12"x12"x12" box. Chris Atkins, MAEP curator is on hand in this segment to receive the work and talk about the enormous undertaking that is Foot in the Door. Artists: Originally from Burkina Faso, Rabi Sanfo says his family couldn't afford to buy toys and playthings for him and his siblings. So, he made them. It has led to a lifetime of creating artwork like the metal sculpture he created for the Foot in the Door exhibition. Since he immigrated to Minneapolis in 2004, he has created a body of work that utilizes his skills as a welder and metalworker. Rabi just closed a solo show at the Frank Stone gallery in Minneapolis. Designer and Illustrator Kathy Littfin is a recent graduate of the Art Institute International Minnesota. Her colorful paintings and line drawings tend towards letting things happen as opposed to working within the rules and constraints of the design world. Geoff Bush is a sculptor who intended on giving the MIA staff a challenge when he brought in his 80lb soap stone sculpture. He creates much of his work based on the Chinese Book of Changes and incorporates found objects and personal stories. 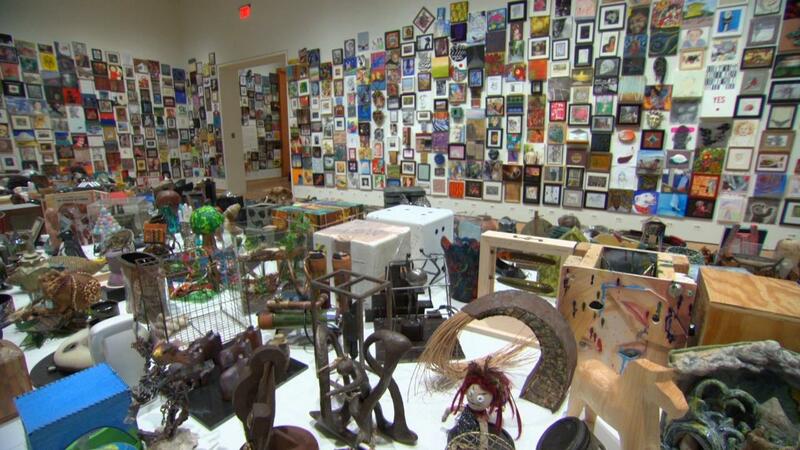 Foot in the Door gives artists a chance to exhibit in the Minneapolis Institute of Art.